Once all the bark and other debris are off the log, it is ready to be cut in to boards. 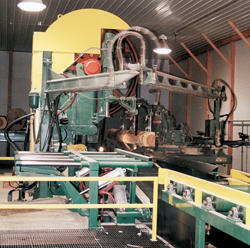 SIH uses a head saw manufactured by HMC. When the log is loaded on the carriage, it passes through a scanner. The scanner positions the log for the sawyer for the proper size opening face. 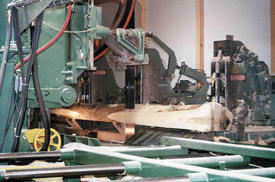 The carriage passes by the band saw and the cut board falls onto a belt which sends it along the production line.